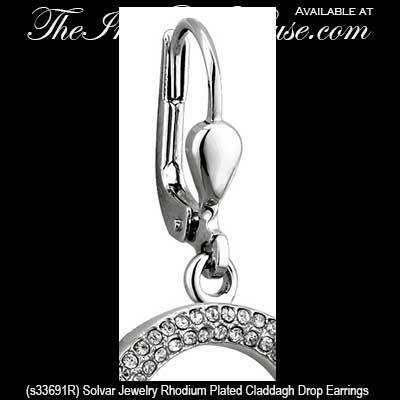 These dangle Claddagh earrings are a rhodium plated design that is enhanced with CZ stones. 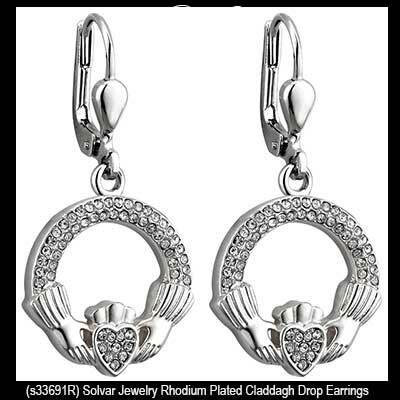 These Claddagh earrings, like all the Irish made jewelry at The Irish Gift House, are nickel free and hypoallergenic. These Claddagh earrings feature a rhodium plated finish along with CZ stone studded hearts and two rows of additional CZ stones that extend from cuff to cuff. The dangle Claddagh earrings are on latching Eurowires and measure 1/2” wide x 1 3/8" tall to the top of the wire. 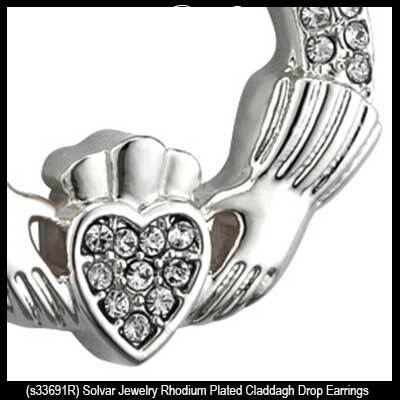 The Irish earrings are made by Solvar Jewelry in Dublin, Ireland and are gift boxed with a Claddagh history card that is complements of The Irish Gift House.